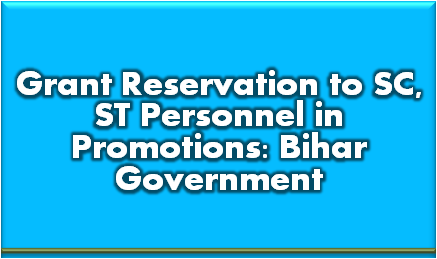 Patna, July 22: The Bihar government will now grant facility of reservation in promotions to the Scheduled Castes/Scheduled Tribes personnel in its services. The decision has been taken following an advice received from the Union Personnel and Training Department in the light of the orders passed by the Supreme Court on May 17 and June 6 on a special writ petition. According to an official notification, such promotions would, however, be subject to further orders of the Apex Court. The decision in this regard was taken in the light of the recommendations made by a high-level committee of state government officials constituted for the purpose on June 27 and legal advice obtained on it, the notification said. 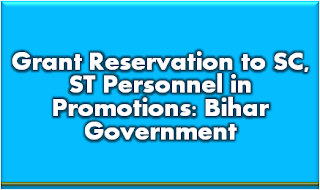 The notification also gave detailed guidelines for effecting such reservation in promotions.